Between 2011 and 2013, venture capital firms invested $50.8 billion in U.S. companies, giving thousands of entrepreneurs the opportunity to grow and scale their businesses. According to a report by Babson, however, just $1.5 billion – or 3 percent – of those venture capital dollars went to companies with a woman CEO. So what’s the deal here? What’s with this dearth of women-led, venture-backed companies? The answer is complicated, but has a lot to do with the “venture-backed” part. Just four percent of venture capitalists (VCs) – the people deciding where all that capital goes – are women. I’m one of them. That means 96 percent of the people who invest those dollars are male. When the vast majority of investment decision-makers are men, it follows that most people receiving capital will be as well. Whether it’s because of implicit biases, closed networks, or the tendency of VCs to invest in people like themselves, women face an uphill climb when trying to secure funding in a male-dominated system. My mission is to help change that, and to give more women access to the funding, networks and advice they need to meaningfully grow their companies. About four years ago, I began dabbling in angel investing. Today, I’ve invested in 12 companies, 11 of them founded by women. When I joined Rothenberg Ventures as partner in 2014, the first deal I brought in was Hello Giggles – an online community with three female founders that was recently acquired by Time, Inc. I don’t invest in women-led companies to be nice or simply because I believe we need more female representation. I do it because these entrepreneurs bring a new perspective, a deep understanding of market problems that are unique to women, and the passion, grit and drive necessary to grow successful businesses. That, plus the fact that tech startups with women executives achieve a 35 percent higher return on investment. Investing in companies founded and led by women is a smart business decision – and the more people that realize that, the more we’ll see venture capital flowing to female talent. While access to capital itself is a major roadblock for many women, it’s not the only one. Young female entrepreneurs often don’t have access to the networks their male counterparts do. Moreover, because there’s a lack of female leadership in VC and at venture-backed companies, young women often don’t have role models to look up to. A lack of mentorship and resources as well as closed networks means many women can’t even get in the room to pitch their companies in the first place. For these reasons, my focus is not only funding women, but also advising them. I’ve mentored hundreds of women around the world; it’s the most gratifying piece of what I do. While there’s a limit to how many dollars you can invest, there’s no limit on the number of introductions you can make or how many young women you can inspire. Programs like Project Runway’s Project Entrepreneur and 92Y’s Women in Power are cropping up to formalize this experience, connecting young leaders with the mentorship, resources and networks needed to grow successful companies or rise to the C-Suite. As an example, I created this template for Project Entrepreneur to help women founders nail their first pitch. Mentorship is my way of paying it forward. Combined with my investments, it’s how I’m working to close the gap in the VC and startup worlds. And I’m not alone. More and more women and men are working to change the ratio by advising young women, sharing stories, providing encouragement and introducing these emerging leaders to the right people. We do it consciously. We do it regularly. We do it because we know it’s making a difference. I encourage any leader with resources to give – whether it’s advice, funding or introductions – to join us in creating this change. Fran, thank you so much for your phenomenal support of women. You are an inspiration and role model for women around the world, and this message is a powerful call to action. Fran, you are a true inspiration for us all! Thanks for making a difference! Can't wait to see you speak again at NYU in NYC on 4/20! Thanks, Suzanna! I'm excited for April 20th! Ms. Hauser, I really connect with your message, that questioning is a powerful tool. I have an amazing idea but am new to the entrepreneurial and tech industry so I am educating myself. Every new question I have answered brings up 5 more which makes me even more excited about entering this field. My question for you: Many articles in Forbes and Business Insider, to name a few, connect having a successful business with finding a mentor, and as this is your passion, how would you suggest someone go about finding one. The one tech and startup field is new to me so having some guidance through these first stages would be invaluable? Thank you! Hi Maariana! It's so important to have a mentor to guide you through all these stages and even more than one is ideal. There's a whole lesson on how to find a mentor, how to maximize their feedback and how to find one best suited for you and your needs in the Mogul Career course and you may also find a lot of useful info in the starting a business course as well. Definitely check it out! That's incredible information Natasha. Thank you! You're so welcome Maariana! Good luck with everything and I hope it's useful info for you! Hi Maariana! You're right that having a mentor can be invaluable when you're breaking into a new space. There's no one way to find the right mentor, but I'd start by zeroing in on what type of guidance you think you most need. Once you have a clear understanding of that, think about people who can help you get there. Maybe there's someone in your life already -- or maybe you'll have to reach out to someone new. Either way, start by asking those people if they'd be willing to have coffee, hop on the phone or answer some questions over email. Or you could try to meet them in-person at an event. The more people you meet, the better chance you'll have of finding someone you click with who can eventually become a mentor --- plus, you'll get a lot of great advice along the way. Fran Hauser walks this talk. A true angel. Thanks, Dani! It takes one to know one! 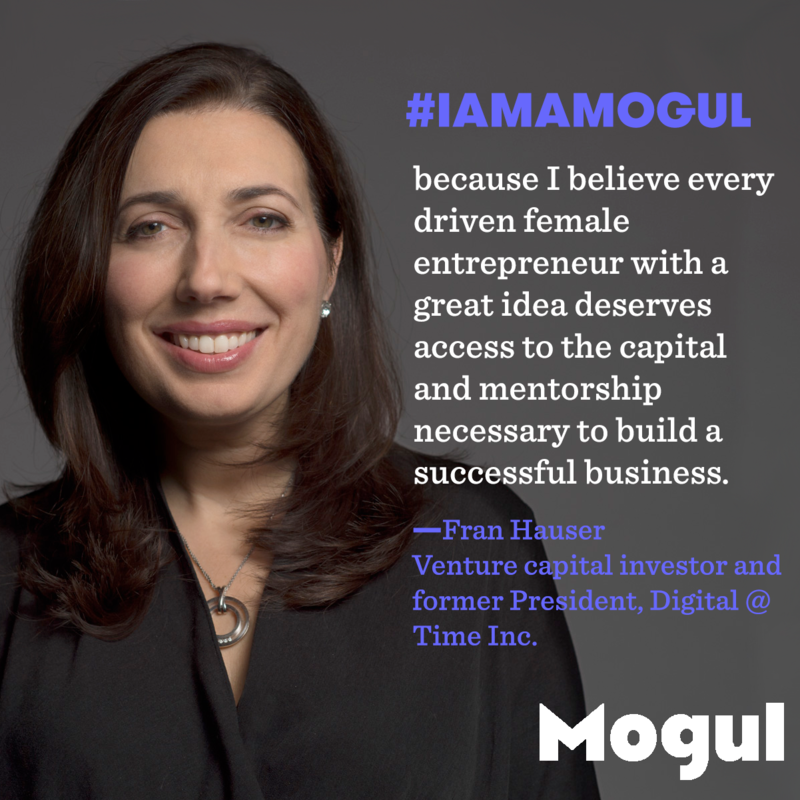 Fran Hauser (@fran_hauser): Angel Investor. Digital Media Veteran. Advocate for Women and Kids. Proud Mom. Passionate about connecting people & inspiring change. Bisila Bokoko II 36 and 44 others upvoted this.